Building the centerboard was a great example of why I so enjoy building this sailboat. It was a project with a number of tasks that at first I really wasn’t sure how to accomplish, but by taking it one step at a time, doing some research and then putting in the work required I was rewarded with a great sense of achievement, (not to mention a functional (hopefully) centerboard). 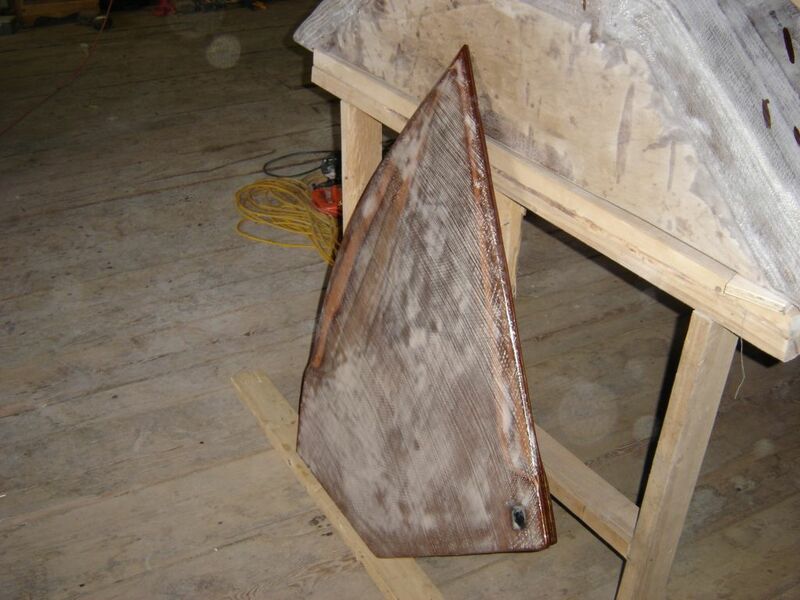 To achieve the desired thickness the VG23’s centerboard is made from 3 pieces of 3/8″ ply so after cutting the shapes I laminated them together with the usual woodflour / epoxy putty. A group of woodclamps held the board together as the epoxy cured. Shaping the profile of the centerboard into something resembling a NACA profile was a task that I really wasn’t looking forward to. I knew it was going to entail a fair bit of work and I had, (still have actually), doubts about the performance improvments it would provide. After consulting the very knowledgable group in the bateau2.com message forums I decided to go ahead and shape the board. After plotting a number of profiles for the v shape of the centerboard I followed Justin Pipkorn’s advice and cut some cardboard template “molds” to help measure the profile. Then I set to work with the planer, a wood rasp and my trusty orbital sander. Eventually I had a sleek looking centerboard that reasonably matched my templates and as a bonus was able to collect a fair bit of sanding “dust” to augment my woodflour supplies (fillet putty made from sanding dust is incredibly smooth, nearly paste-like in consistency). After a bit of searching I managed to track down some Delrin to act as a bushing for the centerboard’s pivot hole. The supplier I found only stocked tubular shaped Delrin so in order to make it less likely to want to turn in the board I squared it off (more or less) on the radial arm saw. I say more or less as Delrin is well, very hard and you can imagine how easy it is to clamp a chunk of round plastic in place. Finally, after drilling the pivot hole I embedded it in the centerboard. Weighting the board with lead was another task that I approached with some hesitation. Obviously it needed to be done – the centerboard on the VG23 is designed to be gravity deployed, meaning when lowered it is simply the board’s weight that holds it down; there is no mechanical force keeping it lowered. Melting and pouring lead however was not my idea of an enjoyable job. I seem to have no problems “poisoning” my body with alcohol in it’s various forms but the very remote risk of lead poisoning had me considering my options. After chatting with the good folks at Canada Metal and repeatedly reading that heating lead only really became dangerous when it got so hot as to vapourize I once again overcame my reluctance. Using a router I bore a few cavities in the board using a dovetail bit around the edges to help hold the lead in place (I also added a few brass screws in the “walls” of each cavity). I melted the lead shot (outdoors) in a stainless steel pot over a propane burner (being careful to only heat it to the point of melting) and carefully poured it into the cavities. The process was so simple I was left wondering why I ever had doubts. Once the weighted centerboard had completely cooled I encapsulated it with 12oz fibreglass cloth and used quikfair to get it fair. After a flow coat of epoxy it was ready for painting. Looking Good, Andrew. I cannot wait to get a view of the finished product. I like the improvements over the VG20, although the trailing skirt aft on the VG20 adds a lot of versatility. Keep up the good work. Thanks Tony. I’m beginning to get anxious to get her finished too. Personally, I’m torn about the skirt. As you say, it adds some important functionality. Aesthetically though, I’m not too keen.